It looks like Fourth of July fireworks captured in wooly glory. 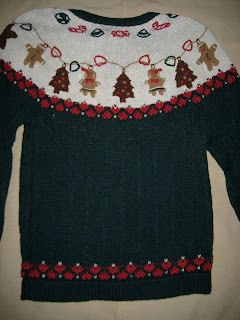 Let's hang giant sized gingerbread men and christmas trees around the neck. This is kinda cute in an L.L.Bean waspy kinda way, yet would flatter exactly one person on the planets figure and she won't wear it. Wearing this outfit would probably get you stoned to death in Saudi Arabia. 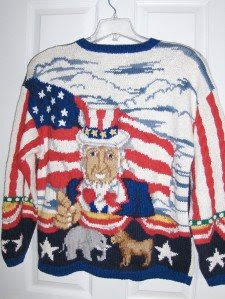 Wearing it here in the States means you are stoned. 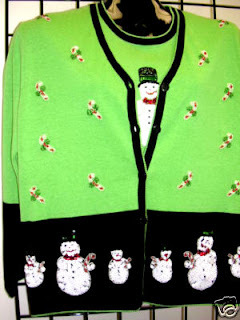 Ugly Christmas Sweater Season has started! 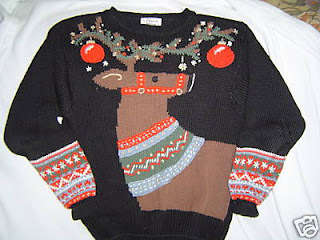 I will aspire to post a new fugtastic Holiday Themed sweater on a bi-weekly basis. 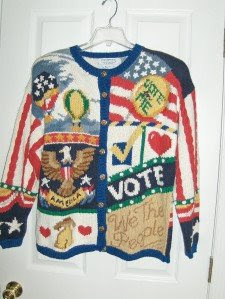 Now, onto this gem of a sweater. Candy Canes and a peeking snowman on the shell are adorable. It is the Neon Green that concerns me. 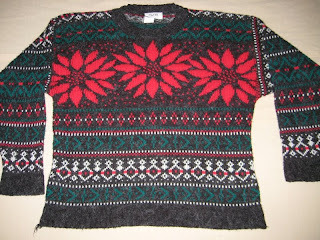 A Very Scary Journey Into Hideous Knitwear Design. Enter if you dare.